I wanted to bring to your attention a couple of updates you may not have noticed. Let me get right to them. 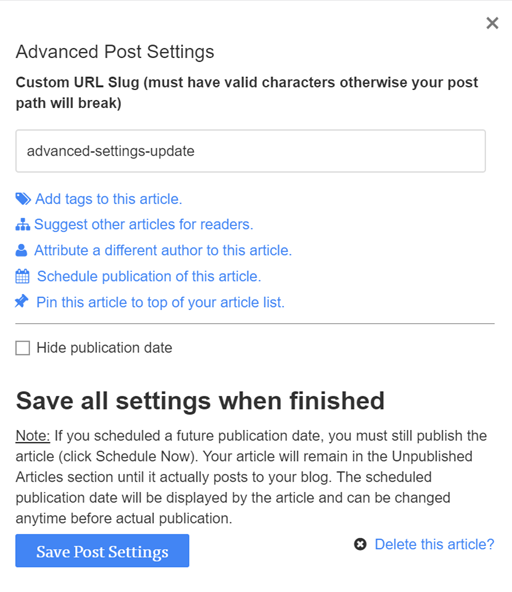 In addition to tagging, scheduling, and suggesting other articles to your readers within your article, you can now pin an article to the top of your blog post list. This is a nice option for those posts that were particularly popular, or ones you feel highlight a topic worth keeping at the forefront of your readers' minds. A second addition to Advanced Settings is the ability to post articles without a posting date. This has been a request by some. This capability allows you to 'evergreen' certain content a bit easier and thus, allowing it to maintain relevance longer. Dating a post immediately starts the clock ticking on the aging of your post, at least in the eyes of your readers. And, frankly, it takes some pressure off you having to always be posting new material. Third, you can change the date of your published work. 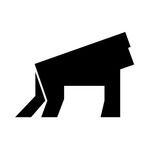 Changing the date can change the order of presentation in your article list. This flexibility allows you to re-position content. This is particularly useful for those writing a series of articles that are best read in a fixed sequence. And, of course, those using Silvrback to draft and get feedback on book chapters want the reader to start with at the beginning, which will likely be your oldest post. This is a handy capability. We all know how difficult it can be to get readers to comment via Disqus on your work (or any commenting system). It requires more, uh, commitment, let's say, on the part of the reader to log in and make a response. This generally results in less interaction than many of you would like. The like button is a much easier reaction measure, one that readers seem willing to use more often. This gives you, the writer, some sense that someone read your work and has expressed a positive reaction to what you have posted. Notice, at this time, the function only will allow for affirmative responses. That is, they can give it a thumbs up, or not. The option for a thumbs down is not included here. Why? Well, we were kind of mixed opinion internally about this. In the end, we think a like is accepted as an affirmation that the piece you wrote was valued in some way, and that is satisfying. A thumbs down leaves us wondering what they didn't like about it - didn't like any of it, one section, what? And, since people don't often want to comment and give us a clue as to the why of their negative response, we're left a bit bewildered. Unsatisfied. So, we opted for the single choice - like or don't. As an optional feature, you must enable this function through your Blog Setup screen. Scroll down just below the Google Analytics setup option and you'll see the Reader Feedback section. Default is Disabled mode. As with all setting changes, don't forget to save these before closing out of the screen. That wraps up this update. If you haven't heard, Postagon is shutting down June 1st. We considered it one of our competitors in the small platforms space. For our part, we continue to invest in the product and strive to reach a wider audience. We have the resources to do so. We're thankful about that. But we can use your help in this regard. This does bring me to my concluding point. Do recommend Silvrback to your colleagues, family and friends, even your enemies (you will confuse them). We have a solid product here, and I believe you think so, as well. Word of mouth is the most valuable word in the marketplace. We would appreciate you giving us yours. As always, thanks for writing with us!